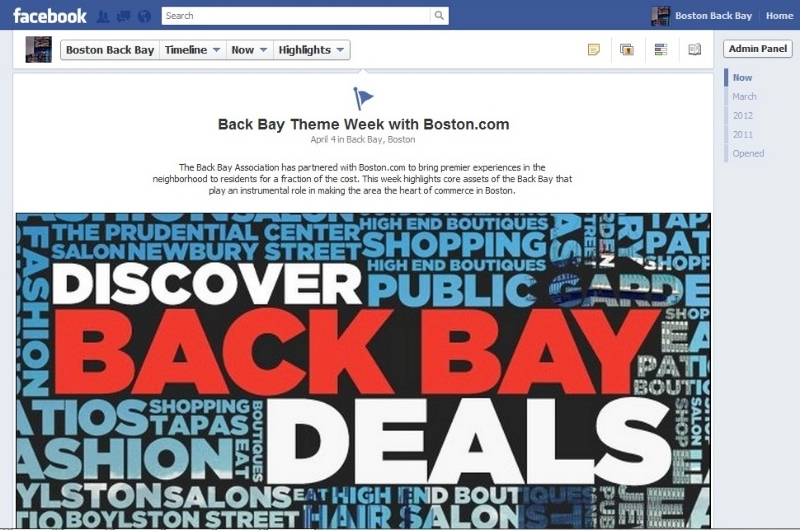 In the fall of 2011, the Back Bay Association was looking to transform its brand. 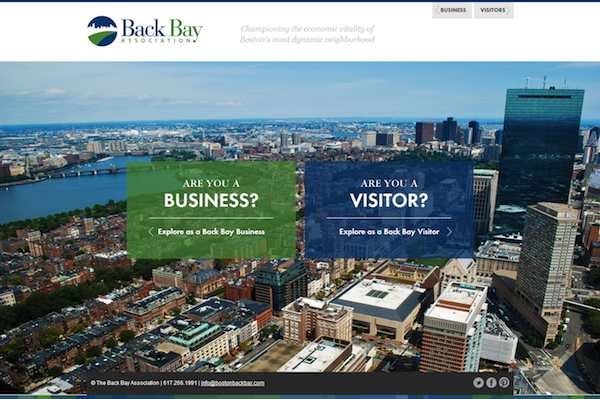 A dated website, fragmented communication channels, and the absence of an articulate value proposition was inhibiting the neighborhood association from conveying the benefit it offers the Back Bay. I joined the BBA that October with the mission of rebranding this 90 year-old organization, and with the help of the first ever Intelligent.ly course with renowned brand artisan Mike Troiano, we nailed it. In “How to Tell Your Brand’s Story Effectively”, Mike Troiano offers a detailed framework to articulate your message into something consumable and actionable for your target. Through case studies, collaborative workshops, and his extensive personal experience, he guides students through a scientific approach to crafting this language. The three key takeaways from this course are the structures for your “Golden Circle”, Message Model (this helps you craft your positioning statement), and your “One Simple Thing” (OST). Clearly communicate the value of the BBA. Represent the visual brand of the neighborhood. 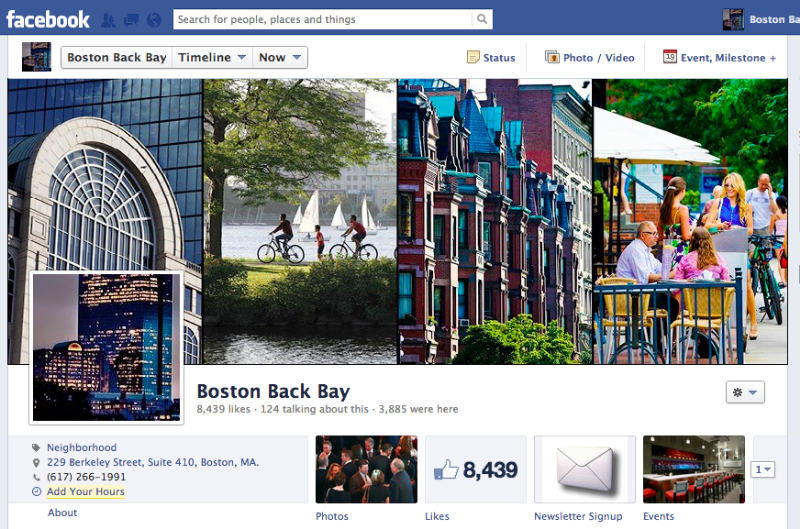 Become THE curator of information and news for Back Bay. Be THE resource for businesses, and act as liaison with city. At the foundation of everything was our positioning language. This was the crucial piece that would dictate everything from our website design, calls-to-action, and sales material. It was clear that even though the association was approaching its 90th anniversary, a clear concise value proposition hadn’t been universally adopted. Some stakeholders would even default to calling it, “Like a chamber of commerce for the Back Bay.” Diving deep in the qualities represented in the brand and applying the structures set in Mike’s Intelligent.ly course, we defined the “One Simple Thing” that communicates the core value of the BBA. 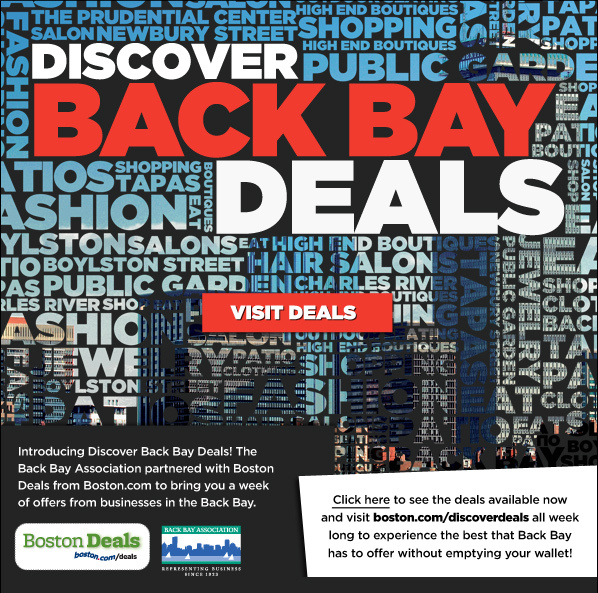 The Back Bay Association, established in 1923, is Back Bay’s largest and most prestigious organization representing local businesses, retail merchants, restaurants, hotels, property owners, major corporations, schools, and churches. 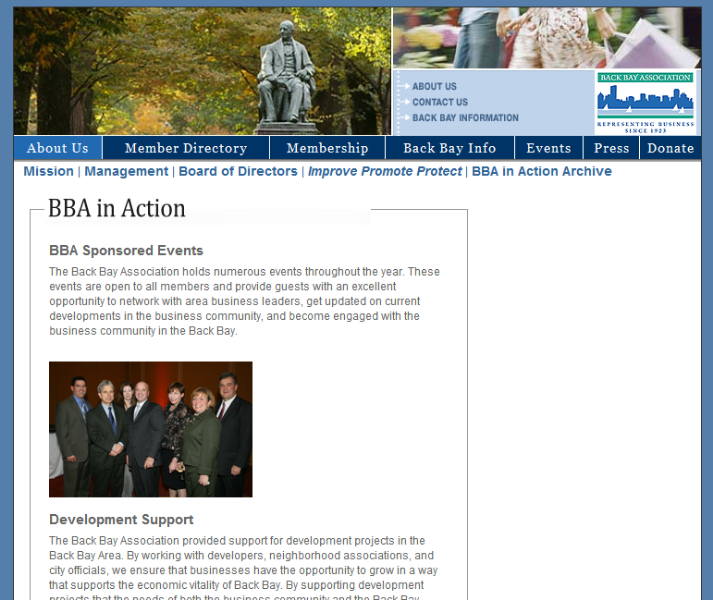 The BBA is the advocate for the Back Bay business community. The primary focus for the BBA and its 400 members is to ensure the continued commercial strength of the area and to initiate programs that improve, promote, and protect the quality of life in Back Bay. 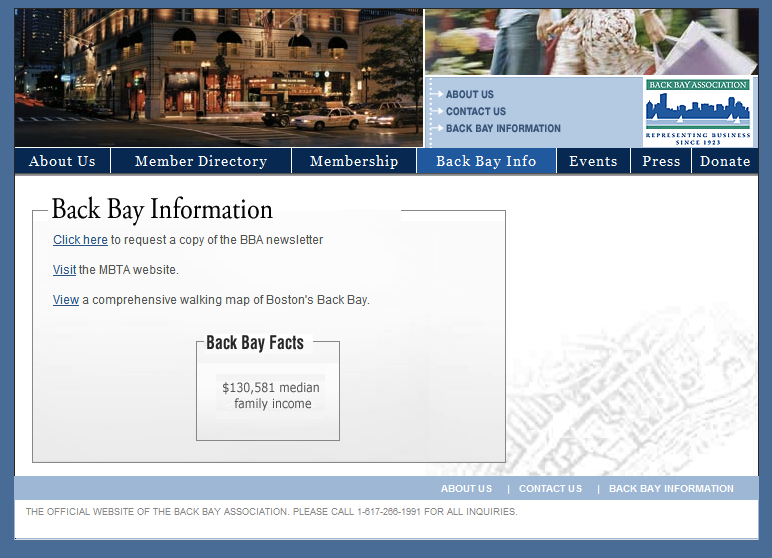 The Back Bay Association champions the economic vitality of Boston’s most dynamic neighborhood. Champions – Evokes the most positive image of advocacy, conveying that our work is to the benefit of the neighborhood. Also embodies all the various actions we fulfill in one word. Economic Vitality – We’re a business association. Our focus on the big picture of economic growth distinguishes us from other neighborhood associations. 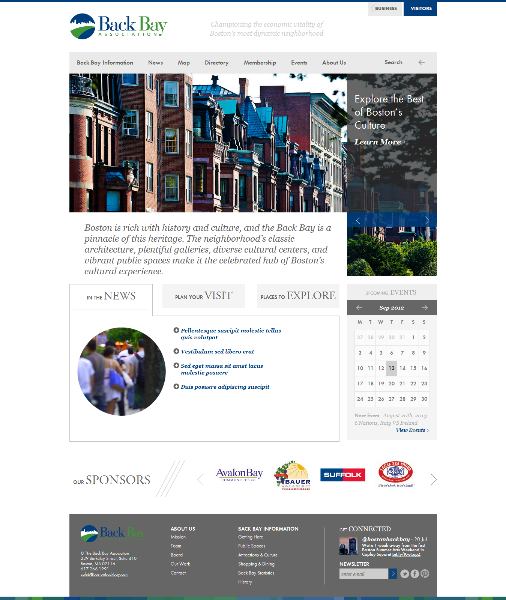 Boston’s… neighborhood – The framework of our target. We’re a hyperlocal association, so we only target businesses within this segment. Most Dynamic – The distinction from all other Boston neighborhoods. Back Bay is the commercial heart of Boston with its shopping centers. Additionally, its unique heritage and prominent cultural centers create an incredibly dynamic residential environment. To reflect the organizational change and evolution of this brand, it was crucial that the BBA redesign its logo. Using our personality traits defined in our message model, we crafted a logo that was positive, inviting, and used colors representing responsible development and forward-thinking. The website was the largest obstacle standing in the way of executing the tactics to accomplish our strategy. To start, the BBA actually had TWO websites; one intended to cater to visitors, and the other to represent the association to local businesses. The site catered to the association didn’t use a CMS platform, making every small edit cost hundreds of dollars for an external web developer to update. This made the website essentially static, prevented the BBA from publishing content, didn’t allow online event registration for an event-rich organization, and the dated coding actually began shutting down the website server. A relationship with Fluent Concepts led to the solution of all of our digital aspirations. We essential merged both sites by incorporating a call-to-action on our homepage to direct visitors or businesses to respective content. Created on a WordPress CMS, the BBA can now edit and publish all content internally at no cost. With the Membee software application members can now register for events online, pay membership dues via the website, and update their member listings/information remotely. Furthermore, the imagery of the site now conveys the vibrant color, architectural heritage, and social fabric of Boston’s most dynamic neighborhood. The respective homepages for Visitors and Businesses have specific calls-to-action to direct traffic throughout the site. They also now feature a sponsor scroll, calendar, social channels, and newsletter signup to aid in developing our communication channels. Making our website THE resource for visitors looking for information on the neighborhood was one of our most important goals. After scouring our website, tourists still didn’t have a comfortable understanding of the neighborhood. I would constantly receive calls from Arizona, New York, and Nevada asking for accommodation recommendations and attractions. One visitor even asked me if it was a safe neighborhood, due to the low price of her hotel booking. If the website didn’t convey it was one of the most affluent, beautiful neighborhoods in Boston, we certainly had room for improvement. The redesign included vibrant images of public spaces, brownstones, and lifestyle centers to craft a visual representation of the Back Bay. Detailed information, calls-to-action, and featured attractions improved this valuable resource. Visitors can now explore accommodations, landmarks, and cultural events with ease. 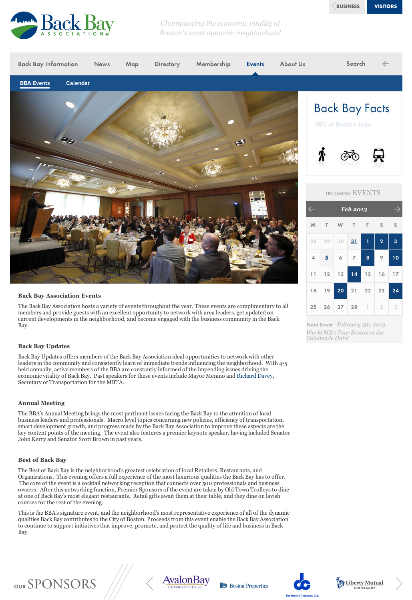 While our events are one of the core member benefits, they weren’t detailed on our website. The new site offered descriptions for each type of event, and an image of our most recent with Senator John Kerry. Communicating our value was our most imperative objective. Under our work section we clearly articulated what projects we facilitate, included powerful images, and featured the influential committees on which we serve. 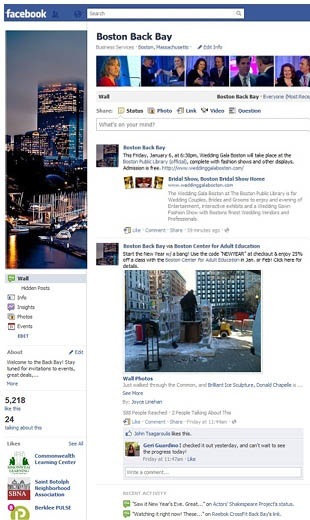 The BBA actually had two identical Facebook pages as well, one being a Brand page and the other a Place. The aggregation of fans was slow, with only a handful per week. After owning and merging both pages, I added a vibrant cover photo, uploaded photo albums from events, and followed member pages, effectively creating a newsfeed of relevant content. I used Facebook as the page itself to comment on members’ updates, share content, and engage relevant users. These tactics resulted in a 60% growth to 8,500 fans, and a peak of 27,000 weekly impressions. A similar strategy grew our Twitter followers by 57%. 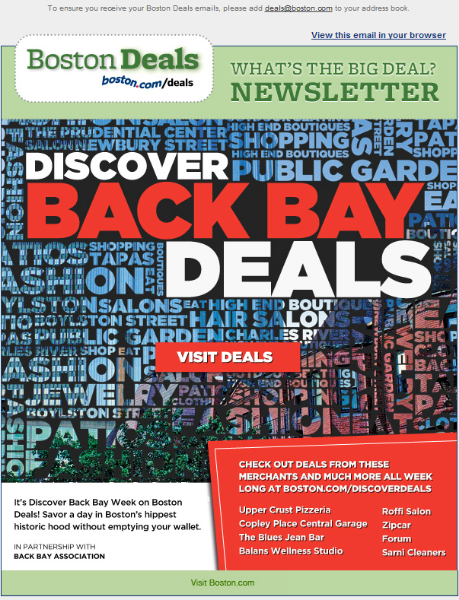 To achieve our goal of becoming the content curator for the Back Bay, we also turned to our newsletter. The transfer to Mailchimp saved costs, improved analytics, and consistently removed obsolete email addresses from our list. 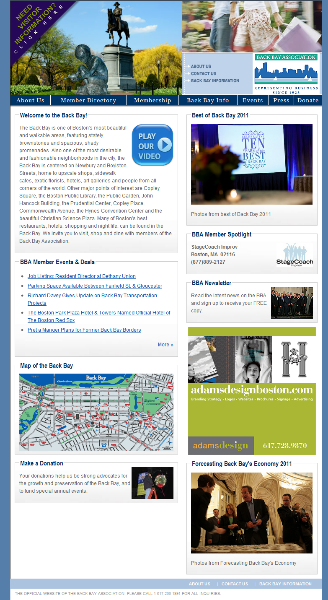 I created a Google Alerts feed for Back Bay and all of our 400+ members. 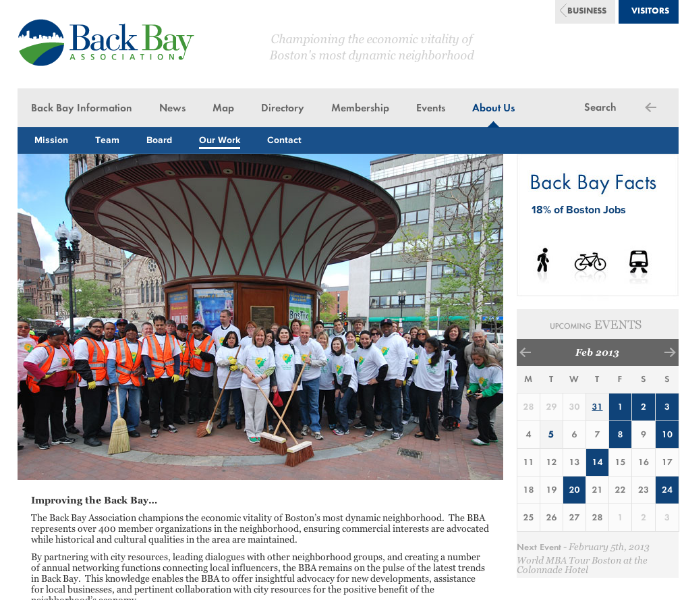 This enabled the most content rich newsletter for the Back Bay, which was recognized by board members, local media, and members alike. Since the BBA, and the majority of its members, has no ad spend, I began exploring innovative ways to attain the same promotion. 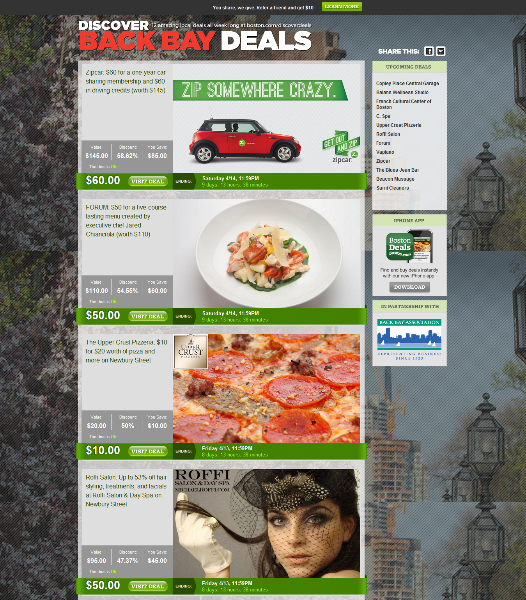 It was at this time I connected with my good friend Chris Rohland of Boston.com, and we executed the first hyperlocal themed Boston Deals week. 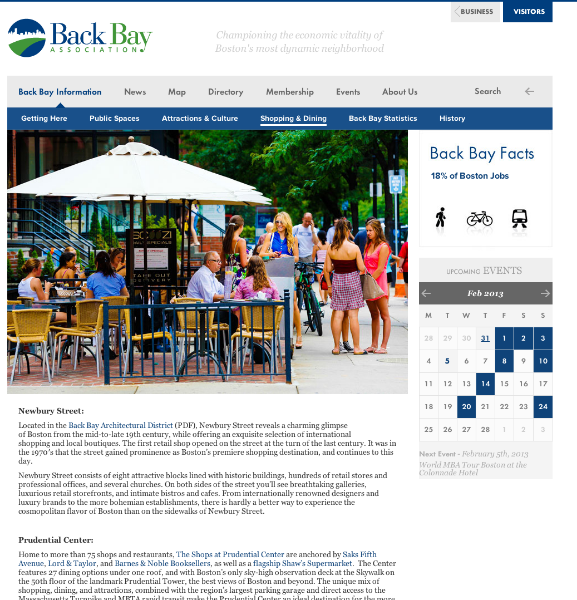 The concept was to include 10 members of the BBA that represented a variety of the culture, cuisine, and experiences the Back Bay has to offer. 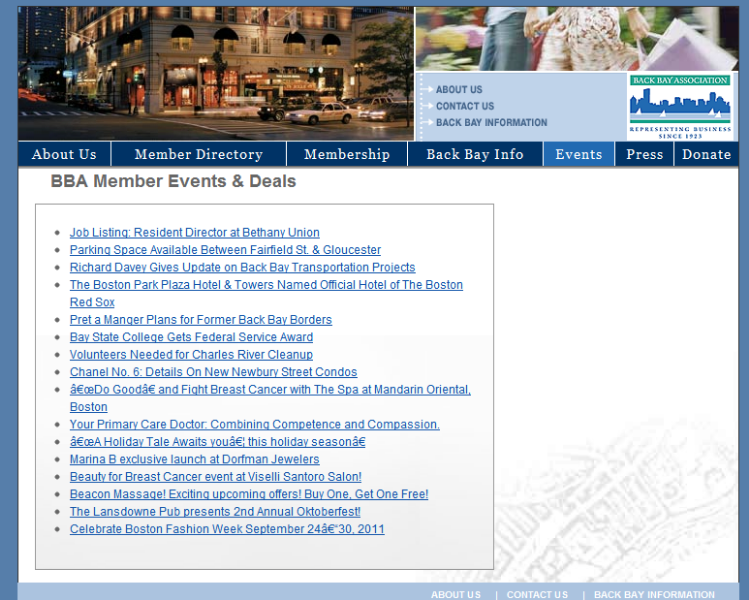 It was channel to help brand the Back Bay as a whole, offer incredible print/digital/social promotion to members that couldn’t afford it otherwise, and add a benefit of membership by driving sales to participating members. The results were fantastic with some merchants like Beacon Massage booking 150 appointments, and the French Cultural Center growing its young professional network by nearly 50 members. Before you launch your startup or rebrand an organization, it’s crucial to define these positioning statements. Not only does it enable you to communicate your brand to consumers, but it clearly defines a unified blueprint for the values to which all stakeholders should adhere. The structure provided by the OST, Message Model, and Golden Circle should serve as a solid foundation for moving forward any entrepreneurial plan. Nice breakdown. I like the neighborhood curation and resource/advocate idea. How did you test the One Simple Thing statement? As Mike says in the class, the OST is something you want to define for your brand, otherwise the market will create one for you. One that you clearly don’t have control over. 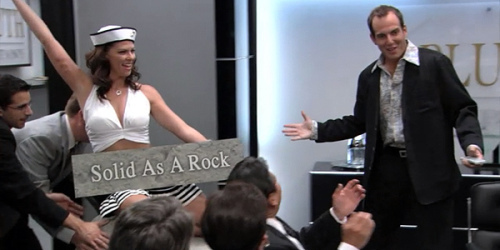 This is a way of preemptively designing how your brand will be thought of. The core of our aspirations, if you will. To test if it conveyed our mission properly, we consulted many internal and external contacts of the organization. We didn’t test individual keywords extensively, we just defined the language we wanted people to use to describe us, and made sure it was easily conveyed. It’s never the tools, Caleb. Always the craftsman. Thank you so much for the kind words, I’m glad the framework helped. We’re doing another one at , feel free to stop by and tell your story as part of it. Great job on this, textbook execution. And thanks again for the props.